The South Florida Water Management District, Florida Department of Environmental Protection and the Florida Department of Agriculture and Consumer Services have contracted HydroMentia to build and operate an Algal Turf Scrubber® at Taylor Creek. 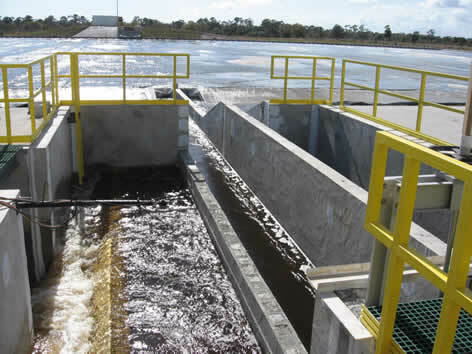 This system was constructed to reduce phosphorus loads discharged from Taylor Creek to Lake Okeechobee. The Taylor Creek Algal Turf Scrubber® (TC-ATS) Nutrient Recovery Facility opened in January 2007. The process area for the TC-ATS covers 3.6 acres and is designed to remove excess nitrogen and phosphorus from a design flow of 15 millions gallon per day. With significantly higher areal removal rates than treatment wetland systems, the TC-ATS offers a cost-effective alternative option for phosphorus and nitrogen control in the Lake Okeechobee Watershed. The TC-ATS uses periphytic algae to recover excess nutrients in the surface water. The algal biomass is then recovered on a typical 7 to 14 day cycle. Recovered biomass at the facility is processed into an organic fertilizer/compost product that will be used as a substitute for inorganic fertilizer in both urban and agricultural applications. The startup and stabilization phase for the TC-ATS began in late January 2007. Dependent on water quality, temperature and season, the start-up and stabilization period will typically last for a period of approximately 6 months, during which the mature algal turf community is in a development phase. For the TC-ATS first quarter of operation, areal removal rates for phosphorus and nitrogen progressively increased as the algal turf community became established. During this period the system processed on average 13.7 million gallons of water per day (or 21.2 cubic feet per second). Inflow total phosphorus concentrations for the initial start-up and stabilization period ranged from 62 ppb to 269 ppb, averaging 166 ppb. During this period the areal phosphorus removal rate increased from 41.6 to 64.8 lbs/acre/yr (4.7 to 7.3 g m-2 yr-1), averaging 54.4 lbs acre-1 yr-1 (6.1 g m-2 yr-1) for the period. Mean monthly inflow and outflow total nitrogen concentrations for the period ranged from 0.76 mg/l. to 3.29 mg/l, averaging 1.58 mg/l. The nitrogen areal removal rate averaged 470 lbs acre-1 yr-1 (52.7 g m-2 yr-1).